Dr Thomas Margoni (Director of the LLM Intellectual Property and the Digital Economy and Senior Lecturer in Intellectual Property and Internet Law) reports on the 2017 CopyrightX Summit, held at Harvard Law School. 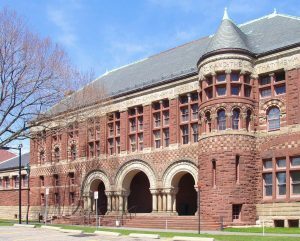 The second CopyrightX Summit took place between 15th and 17th of May and was hosted by Harvard Law School and the Berkman Klein Center for Internet and Society in the beautiful Wasserstein Hall building of the Harvard Law School. During three full days of discussions and presentations, more than 30 CopyrightX teaching fellows from six continents (not Antarctica, yet!) had the occasion to interact in person and to exchange their experience of teaching the CopyrightX course. As part of this network, The University of Glasgow Law School and CREATe have offered CopyrightX (CopyrightX: Glasgow) to a selection of their own IP LLM students for the first time this year (but for the teaching fellows this was respectively the second and the fourth time). It was very successful, with complete student satisfaction and big plans for future editions. The main teaching fellow of CopyrightX: Glasgow is Dr. Thomas Margoni, who is also Convener of the LLM programme in Intellectual Property and the Digital Economy and Faculty Fellow of the Berkman Klein Center for Internet and Society at Harvard Law School. Dr. Giulia Dore, a post-doc researcher on the OpenMinTeD project has acted as an invaluable assistant teaching fellow. The course ran from January to May and the first CopyrightX:Glasgow certificates will be issued to successful students over the next few weeks! The CopyrightX network has been constantly growing from the first pioneering affiliate of 2013 to the current network of 20 affiliate courses taught in more than 15 countries (link to. For the second time, this wealth of national and international copyright expertise met for three days of enriching exchange of expertise, ideas and opinions on both pedagogical as well as research and policy copyright aspects. The first CopyrightX Summit was hosted by Monash University in Prato, Italy and was a huge success in terms of organisation, participation and intellectual experience. On the basis of such a positive experience CopyrightX Summit has been “promoted” by acclamation as a must-have yearly appointment to bring together an incredible variety of international copyright scholars. In order to keep up with the global dimension of the network the Summit will be itinerantly hosted by the affiliates. The question now is, where will CopyrightX Summit convene next year? While nothing can be revealed in this blog post, it is worth pointing out that one of the closing presentations of this year’s summit discussed the copyrightability of Yoga positions.